MIAMI GARDENS, Fla. The championship was locked up by halftime. By the time the confetti landed, Alabama was already looking ahead to the next one. That's the way it is for the latest dynasty in Tuscaloosa. Win a title. Move on. Quieting the Irish on the very first drive, Eddie Lacy, AJ McCarron and the No. 2 Crimson Tide rolled top-ranked Notre Dame, 42-14, for the BCS championship Monday night, locking up a second straight national title and third in four years with another laugher of a title game. The Bear would've been especially proud of this one, with Nick Saban and the Tide romping to the second-biggest rout of the BCS era that began in 1999. "The process is ongoing," said Saban, still tightlipped as ever and showing little emotion after the fourth national title of his coaching career. "We're going to enjoy it for 24 hours or so." The Crimson Tide (13-1) wrapped up its ninth Associated Press national title, breaking a tie with Notre Dame for the most by any school and gaining a measure of redemption for a bitter loss to the Irish almost four decades ago -- the epic 1973 Sugar Bowl in which Ara Parseghian's team edged Bear Bryant's powerhouse, 24-23. Bryant won five AP titles during his brilliant career. The way things are going, Saban might just chase him down. Lacy, the game's offensive MVP, ran for one touchdown and caught a pass for another in the final minute of the opening half. He spun away from the vaunted Notre Dame defense not once, but twice, to cap a 28-0 blitz before the bands even got on the field. "They just did what Alabama does," moaned Manti Te'o, Notre Dame's star linebacker and Heisman Trophy finalist. Lacy finished with 140 yards on 20 carries, coming up with two of his best performances in the two biggest games of the year. He rushed for a career-high 181 yards in a thrilling victory over Georgia in the SEC title game, and was nearly as dominant against the Irish (12-1). 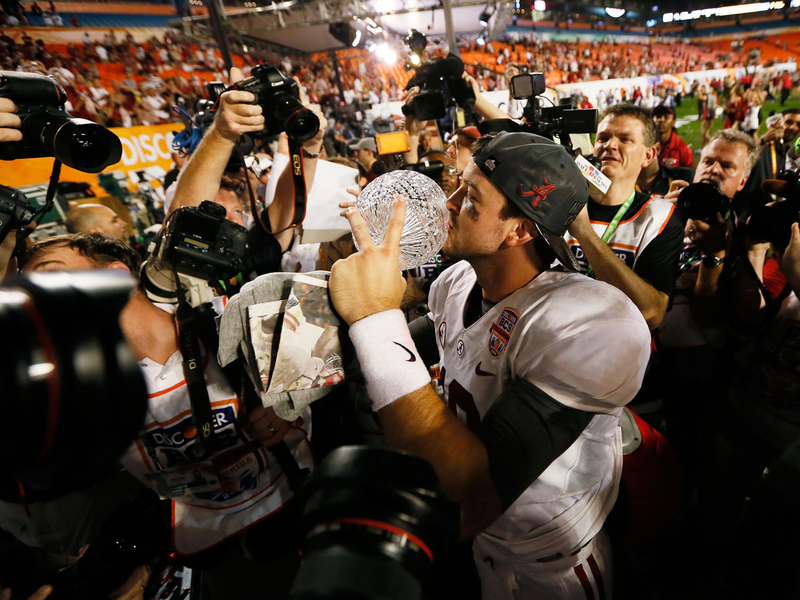 McCarron wasn't too shabby, either, completing 20 of 28 passes for four touchdowns and 264 yards, adding another dazzling effort on top of being MVP in last year's title game. You could almost hear television sets around the country flipping to other channels as the hugely anticipated matchup between two of the nation's most storied programs was reduced to nothing more than the second straight BCS blowout for the Crimson Tide. And, it would seem, they're not content yet. "We're going for it next year again," said offensive tackle Cyrus Kouandijo, only a sophomore but already the owner of two rings. "And again. And again. And again. I love to win. That's why I came here." While Saban insisted he was "happy as hell" and "has never been prouder of a group of young men," it was hard to tell. He was already talking about reporting to the office Wednesday and getting started on next season. "One of these days, when I'm sitting on the side of the hill watching the stream go by, I'll probably figure it out even more," Saban said. "But what about next year's team? You've got to think about that, too." Alabama scored 69 straight points against its title game opponents, going back to getting the final 13 against Texas in 2010, followed by a stifling 21-0 victory over LSU for last year's crown, then scoring the first 35 points on Notre Dame. Saban's team made the Irish look like a squad that would be hard-pressed to finish in the middle of the pack in the mighty Southeastern Conference (SEC), which has now won seven straight national championships. The game cemented the SEC's dominance, asserts CBSSports.com columnist Gregg Doyel. "The gap between the SEC and everyone else isn't getting ridiculous; it is ridiculous," he writes, adding that the SEC is "clearly superior to the rest of college football." Saban, the diminutive man with the perpetual scowl, has guided Alabama to the top spot in the rankings three times since arriving in Tuscaloosa in 2007, and if he's serious about finishing his career with the job he has, there seems no reason he can't win a few more before he's done with "The Process." Already, Saban is the first coach in the BCS era to win national titles at different schools, capturing his first at LSU during the 2003 season. Now, he's the first coach with back-to-back BCS titles, and given the youthfulness of his team, Alabama figures to go into next season as a heavy favorite. In an interesting twist, Saban's fourth title came in the stadium where he had the only stumble of his coaching career, a two-year tenure with the NFL's Miami Dolphins that ended ugly, with the coach insisting he wasn't planning to leave, then bolting for Alabama just two weeks later. His tactics may have been underhanded, but it's hard to argue with the call he made. Before a record Sun Life Stadium crowd of 80,120 that definitely included more green than crimson, Lacy ran right through Te'o and the Irish on a 20-yard touchdown run before the game was 3 minutes old, capping an 82-yard drive that was longest of the season given up by the Fighting Irish. It would only get worse. Alabama marched right down the field on its second possession, this one a 10-play, 61-yard pounding that finished with McCarron completely faking out the defense and lofting a 3-yard touchdown pass to Michael Williams, standing all alone in the back of the end zone. On the first play of the second quarter, T.J. Yeldon powered over from the 1 to make it 21-0, the finish to another impressive drive, this one covering 80 yards; it included two long completions by McCarron. First, he went to Kevin Norwood on a 25-yard gain. Then, he hooked up with freshman Amari Cooper for a 27-yard gain to the Notre Dame 6. By that point, it was clear to everyone that Notre Dame's hopes of winning its first national championship since 1988 were all done. But Alabama just poured it on. "We've got to get physically stronger, continue close the gap there," said Brian Kelly, the Irish's third-year coach. "Just overall, we need to see what it looks like. Our guys clearly know what it looks like now -- a championship football team. That's back-to-back national champions. That's what it looks like. That's what you measure yourself against there. It's pretty clear across the board what we have to do." Lacy's 11-yard touchdown reception with 31 seconds left in the half left the Irish fans shaking the heads in disbelief, while the Alabama faithful broke out that familiar "SEC! SEC! SEC!" Alabama made it 35-0 on McCarron's second TD pass of the night, a 34-yarder to Cooper without a Notre Dame defender in sight. The Irish finally scored late in the third quarter, a 2-yard run by Everett Golson that served no other purpose except to end Alabama's remarkable scoreless streak in the BCS title games, which stretched to 108 minute and 7 seconds -- the equivalent of nearly two full games -- before the Notre Dame quarterback fought his way into the end zone. The only BCS title game that was more of a blowout was USC's 55-19 victory over Oklahoma in the 2005 Orange Bowl, a title that was later vacated because of NCAA violations. About the only time Alabama stumbled was when McCarron had a miscommunication with his All-American center, Barrett Jones, in the closing seconds. The fiery McCarron shouted at Jones, who just shoved him away. But as the seconds ticked off, they were right on the same page, hugging Saban and celebrating another title. Notre Dame went from unranked in the preseason to the top spot in the rankings by the end of the regular season, winning two games in overtime and three other times by seven points or less. But that long-awaited championship will have to wait at least one more year. Golson completed his first season as the starter by going 21 of 36 for 270 yards, with a touchdown and an interception. But he got no help from the running game, which was held to 32 yards, 170 below its season average. Kelly had vowed this was only beginning, insisting the bar has been raised in South Bend no matter what the outcome. "We made incredible strides to get to this point," he said. "Now it's pretty clear what we've got to do to get over the top." © 2013 CBS Interactive Inc. All Rights Reserved. This material may not be published, broadcast, rewritten, or redistributed. The Associated Press contributed to this report. Indiana police have releaed new clues about a killer they believe is hiding in plain sight. Teenagers Abigail Williams and Liberty German disappeared in February 2017 after going for a hike by an abandoned rail bridge near Delphi, Indiana. The case drew national attention when their bodies were discovered a day later. Don Dahler reports.